MP Online Counselling 2019 will take as per the counselling schedule. A proper schedule will be in order to appear for the online couselling, they are required to register first. 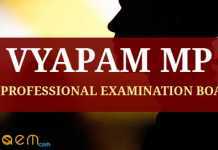 It is only after appearing in the Counselling, candidates can get admission in all government and private institutes of Madhya Pradesh. Candidates can register by visiting the MP Online website. MP Online Counselling is a 5 step process and candidates are required to follow those steps in order to take admission. To know more about MP Online Off – Campus Counselling 2019-20, candidates can go through this article. MP Online Off Campus Counselling consists of Online Registration, Document Verification, Online Preference / Choice Filling and Part Payment of Tuition Fee, Allotment and Admission. Candidates are required to follow some 5 steps in order to do the MP Online Counselling 2019. In order to appear in the Online Counselling, as a first step, candidates are required to first do the Registration. After the registration has been done, the Document Verification Round is going to take place. As the document verification come to its end, candidates are required to select their preferences. Candidates are required to fill their choices and have to do the part payment if the tuition fee. After the step mentioned above, the allotment process will take place. After the allotment has been done, candidates will have to appear in the allotted institute and go through the Verification of Documents again in order to take admission. It is mandatory for all the candidates of the class to get enrolled in the counseling for getting registered. Arrain Line Registration Regional ExaminationAdministrative Examination – Special registration will be required only once in the last post . MP Online Counselling Registration: Click Here > Select Course > Click Course > Click Go For Counselling > Counselling Activities. Candidates are required to click on the link that will be mentioned here on this page or candidates can visit the website for MP Online Counselling which is dte.mponline.gov.in. After visiting the website, candidates are required to select a course. For that, candidates are required to click on the course . The click “Go for Counselling” and then on “Counselling Activities”. Temporary passwords will be received after the registration process, which should be changed and kept confidential in terms of security. The location of Password Counseling can be changed at any time. If a candidate has forgotten the password then that password can be obtained through link or through the authorized help center as per the prescribed procedure. Important Information: It is advised to candidates to keep the password safe with them immediately after receiving it from the governing authority after the registration, as it is an important tool which will be used at numerous places. To appear for the Online Counselling, candidates are required to take all the documents required to the venue where the Counselling will take place and get it verified. After verification, keep a check of eligible / not eligible for safeguarding. Candidates can also get re – verification with their valid documents in case of the receipt of Not Eligible receipt. Candidates are requested to appear with original as well as photocopies of the documents after checking their eligibility criteria. If any candidate is not able to come for the Online Counselling because they are sick or admitted to the hospital, then the admission for only those candidates will be considered. Anyone who will come in their place with the documents, they will have to carry the proof of their admission into the hospital. If after this, the candidates forgot to provide their proof being sick, their admission will be cancelled. So, candidates are required to keep in mind that they will have to appear with correct and authentic documents in order to take admission. Candidates will be able to select at least one and more of the currently available institutions / courses, as per preliminary selection. Candidates will have to fill registration details after login. He / She must ensure that all the filled details are correct. Candidate can edit their details before payment. Take registration receipt after payment. Eligible Candidates are required to fill the Registration Details for the Counselling Process. It is the responsibility of the candidates to make sure that the details they have entered is correct. Candidates can edit the details before doing the payment for the Online Counselling. Also, it is advised to candidates to take the receipt after the payment. After the successful completion of the Registration Process, candidates can select their desired institution in which they want to take admission. In order to the choice filling, candidates are required to pay some amount for their respective courses. A merit list will be prepared for the registered candidates on the basis of their marks obtained in the qualifying examination. The Merit List will be released by the governing authority on the official website. As per the rank obtained by the candidates, candidates will be given an Allotment Letter. After the process of giving Allotment Letter, candidates will be allotted a seat in their desired institution. Click Here for more details of MP Online Allotment Result & Vacancy Details. Candidates are required to present at the reporting time with each and every proof of documents. Candidates can enter the center by using their password and admission slip. Candidates will be declared eligible and not eligible at the time of verification of documents at the centre. The seats for the not eligible candidates will be considered as vacant and will be used for the second round of counselling. Candidates are not required to submit their Original Documents in any case at the examination centre. A second phase of Counselling will also be conducted if any vacant seats remained during the first phase of counselling. However, the same rules will be followed which have been followed during the first phase of counselling. The candidates who were declared not eligible at the time of online allotment, those candidates can also take admission by showing their documents they submitted at the time of registration by improving those documents. After rectifying their documents, candidates can take admission in the second phase of counselling. Candidates are required to follow the steps set by the governing authority if they have to appear in the Counselling Process. Candidates admitted only after B.E. (full-time) course and after the second round of counselling, if they wish to change the branch in their entities, then they will have to submit the options of the bank by applying the application in the prescribed time table. The time to change the branch will be given for short period of time and candidates will have to give their choices in that stipulated time only. Candidates must note that once they have chosen their new branch, their previous branch will not be taken into consideration. After the change, their selected second branch will be taken into consideration. After the various stages of the counselling, a special final stage of counselling can be conducted depending upon the number of vacant seats. So, to appear for this final round of counselling candidates are required to register. However, if the candidates have registered before then it is not required to re – register again. When the candidates will get their documents verified, they can get the print of their registration and verification as required. The candidates who are going to appear in this counselling then they will have to pay the counselling fee and partial tuition fee to lock their priority. The candidates who have not completed the proceedings of the state in the previous councils of counselling or who have got the state in the institution and cancelled them, they will be able to increase their counselling to include them in the Ailetan Priority Order of the Institutions. After the selection, the lock will have to be completed again. The entrance exams for which the entrance examination is conducted will be given admission in the merit of the entrance exam for admission, then there will be a preference for meritorious marks of the qualifying examination on vacant seats. For the admission related qualification, observe the respective paragraph rules of the state rules. MP Pre Veterinary and Fisheries Test Application Form 2019 – Available!